DIGGING FOR ART: Last Sunday an impressive lineup took shovels to the site of the expanded Princeton Arts Council building at the corner of Paul Robeson Place and Witherspoon Street. The diggers are (from left): Realtor Norman Callaway, Jr.; Borough Council President Mildred Trotman; U.S. Rep. 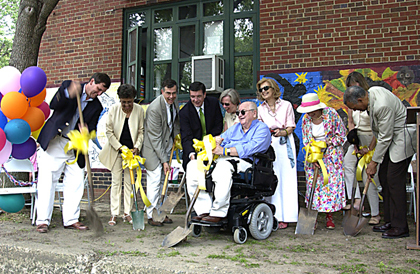 Rush Holt (D-12); Mercer County Executive Brian Hughes; Princeton University President Shirley Tilghman; Architect Michael Graves; Founding Director of the Arts Council Anne Reeves (new Executive Director Jeff Nathanson is not pictured); Princeton Township Mayor Phyllis Marchand; President of the Arts Council Board of Trustees Wendy Mager (partially obscured), and guest of honor Paul Robeson, Jr.
"Dig It" was the theme, and dig they did as the Arts Council of Princeton hosted a symbolic groundbreaking Sunday for an expanded facility, the Paul Robeson Center for the Arts, at the corner of Paul Robeson Place and Witherspoon Street. International investment banker and Princeton resident William Sword, Sr., died at home Thursday in Princeton Township after battling a long illness. He was 80 years old. Nassau HKT Associates (NHKT), the developer in Princeton Borough's downtown development plan, is looking to "recapitalize" its project by possibly bringing in new partners to help carry it forward, according to a Borough official.